Elea - Elea in TOP 25 in student internship satisfaction survey! Elea in TOP 25 in student internship satisfaction survey! 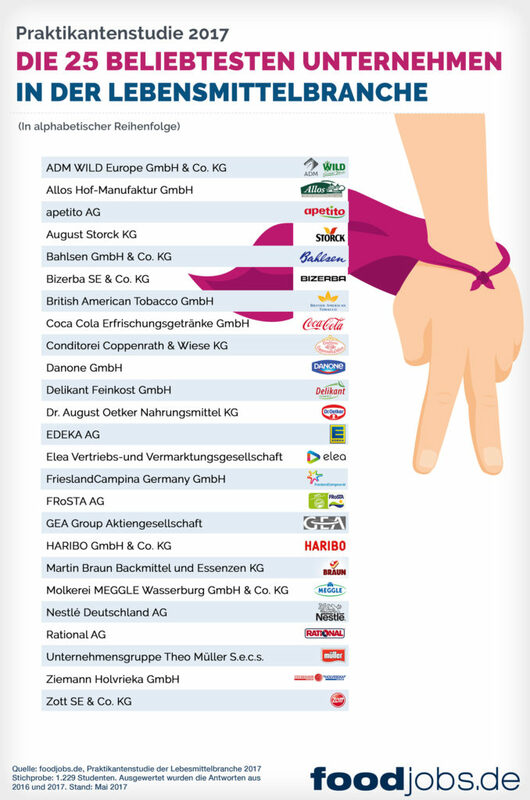 Elea was named directly together with the big players Coca Cola, Dr. Oetker, Danone, Nestle, Müller and many more! Elea has had good feedback from the internship study of foodjobs.de in 2017. Students and graduates were able to evaluate their experiences online with internships in the food industry – with a pleasing result: 89% of all interns said they were satisfied or rather satisfied. The basis for the present results are the answers from 1,229 students who started their internship in the period from 2015 to 2017. Responsible tasks and a motivating working environment guarantee a successful internship. Employers of the food industry ensure high satisfaction of their students. The main prerequisites for a successful internship are still the integration into responsible tasks, the appreciation of the work and the person through a firm contact as well as a positive working environment together with nice colleagues. If companies give their students the opportunity to gain a wealth of experience and take a look beyond the boundaries of their own, the internship is a pleasure for all. We at Elea totally agree and looking forward to work with the next students, following this philosophy.